You are here: Home / Businesses / Collect Form W-9 Now! It is extremely important to maintain Form W-9, Request for Taxpayer Identification Number and Certification, on all people you pay to perform services for your business. This form enables you to correctly file necessary information returns (like 1099s) during the month of January each year. Since January is right around the corner, now is the perfect time to make sure you have Form W-9 for each person and business you made payments to in 2011. 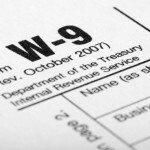 Form W-9 actually serves two purposes. 1) collects taxpayer identification you need to complete information returns in January each year, and 2) helps you avoid backup withholding. The form requests the name, address and taxpayer identification information (usually either the Social Security Number or Employer Identification Number) of a taxpayer you make payment to who is not an employee. The form is not sent to the IRS; it is maintained by the you. When the payee signs the W-9, they certify under penalty of perjury that they have completed the form correctly, are not subject to backup withholding and are a U.S. citizen. Throughout 2012, it is a best practice to require completion of Form W-9 before issuing any payments. Then you are covered. It is easier to have them complete the form when they are waiting on payment rather than trying to track them down to complete a form after the fact.